Bob Off in his home. People often think of miniatures as little more than dollhouses. They can be a fresh and contemporary way to look at the world and have moved away from the purview of the artisan or craftsman into the fine arts. 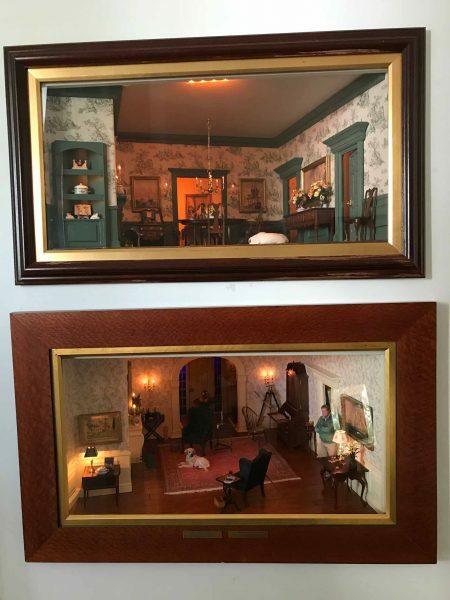 Robert Off, a local miniaturist, turned to miniature boxes when he retired from the real estate business 12 years ago and became fascinated by the creative process. He learned about miniaturism when he was a child. “My father and I shared the hobby of painting miniature soldiers. They were 54 mm in height, the standard for toy soldiers. We painted them individually.” said Off. 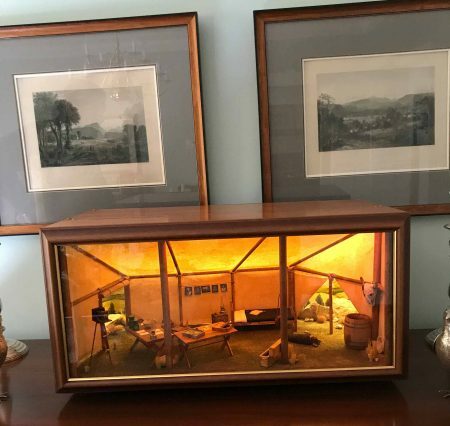 Off’s roomboxes often resemble period rooms in museums, but their miniature scale and intense work and research may seem particularly relevant for the times in which we live. With space often at a high premium, millennials look for smaller, urban housing, and artwork that fits accordingly. So do downsizing baby boomers. “Light is the transformative quality in these rooms; the mood I prefer to emulate refers best to the dream-state of twilight, when shadows emerge from the light,” said Off. 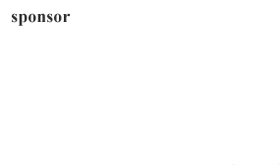 Each object takes on a different quality, according to Off. On two occasions, Off collaborated with well-known artists John A. Ruthven and John Stobart. “I created and designed the boxes, and they created miniature paintings for inclusion in the boxes.” Off used four original oil paintings of maritime scenes by Stobart in a roombox entitled New England Whaling Museum. This roombox appeared in a show at Eisele Gallery of Fine Art in November 2013. Ruthven’s painting is in the roombox located at the KSB (Kathleen Savage Browning) Miniatures Collection at the Kentucky Gateway Museum Center in Maysville, Kentucky. Doug Eisele, president and chief executive officer of Eisele Gallery, originally had contact with miniatures through his Old World Restoration company which has restored hundreds of miniatures from around the country for thirty years. He became more interested in miniatures and travelled to Chicago in 2014 to meet at least a dozen miniature artists. Eisele considers Off a master in the class of miniaturists. “I am not sure how many others there are around the world who work in miniature at the level of detail that Robert Off does. He has taken this to a level of fine art,” said Eisele. Eisele formed a working relationship with Off. This resulted in a phone call from Eisele to Off asking about his joining a show of paintings by Frank and Dianne McElwain from November 17 – December 30, 2017 at the gallery. Off agreed to a second show at Eisele’s. Off works painstakingly in his home studio to create them using engineering and technical skills. “It’s like building a house,” said Eisele, since Off utilizes blueprints and drawings. His roomboxes take from three to four months each to fabricate. He has to order material from sources outside Cincinnati. Cornell (1903 – 1972) influenced Off’s work in making miniature art. He created glass-fronted boxes into which he placed and arranged Victorian bric-a-brac, old photographs, dime-store trinkets, and other found elements. In constructing his miniatures, he not only revived an old format, but he’s one of the first modern artists to combine items from daily life/culture into a fine art format. All those little items in his boxes played on memory, lost childhood, and the like. They are like collaged three dimensional sculptures, in many ways. Collage, perhaps is one of the definitive mediums of the 20th century, as it deals in fragments. Jan Van Eyck’s work (1390 – 1441) influenced him as well. Off’s favorite piece and inspiration is Van Eyck’s Portrait of Giovanni Arnolfini and His Wife (1434) with his use of light, objects as symbols and forced perspective. Kaye S. Browning, Maysville, Kentucky native and collector, founded the KSB Miniatures Collection at the Kentucky Gateway Museum Center, 215 Sutton St., Maysville in 2007. This collection is one of the largest in the world. Browning started collecting miniatures in 1974 after she read A is for Annabelle, a book by Tasha Tudor, to her two daughters aged three and four. There was a bed on the ‘Q’ page which was an exact replica of a bed that she had slept in as a child. The drawing, as most miniatures, was in 1/12th scale. Her former husband created it. “I was hooked!” said Browning. Browning has two roomboxes created by Off. The first one is a collaboration between Off and Stobart in the New England Whaling Museum. The second features work by Off, Beth Freeman-Kane of South Africa, and Ruthven. This roombox is a rendition of a flatboat on the Ohio River where John James Audubon spent time drawing sketches of newly killed birds. “Off has captured the essence of these scenes in his roomboxes, which highlight work of other artisans. His work is unique in his lighting variations from daylight to nighttime,” said Browning. By 2018, she anticipates expanding an additional 2,000 sq. ft. of space to the original 3,400 sq. ft. museum. Over 500 artists from all over the world have created thousands of miniatures which appear in this collection. Close to 20,000 visitors see the collection annually. Everything in the KSB Miniatures Collection is made from original materials, using techniques of which the original full size pieces were made. There are two Guinness World Book of Records rugs in the miniatures collection. The smallest measures 1 x 1.5 inches using 5,000 knots psi. This visitor noticed a sterling silver piece, which is polished, and real beads and gems as jewelry in one box. Browning talks about miniature art in terms of a wide variety of painting techniques and media as well as highly detailed and finished furniture. She thinks it is beginning to be recognized by the art world as a significant art form. The Thorne Miniature Rooms at the Art Institute of Chicago include some of the finest miniatures in any museum in the world. There are 68 miniature roomboxes showcasing European architectural and furniture styles from the late 13th century to the 1930s, when the rooms were made. Off has viewed this collection. Mrs. James Ward Thorne of Chicago painstakingly constructed models on a scale of one inch to one foot. She created miniatures between 1932 and 1940 or asked master craftsmen to make them according to her specifications. They are part of the European Decorative Arts section of the institute and rank in the top three exhibits seen in the museum. Over 300,000 visitors see the collection each year. Lindsay Mican Morgan, keeper of the Thorne Miniature Rooms, said, “This is the only museum with such a large collection of roomboxes made and designed by one individual.” Morgan commented on the importance of Chicago history reflected in them. Cincinnati Art Museum has the Charles Fleischmann collection of nearly 2,000 miniature paintings. Most of them are portraits. Fleischmann started to collect in the 1960’s and made his first gift to the museum in 1981. They are displayed in gallery 213 on the second floor. 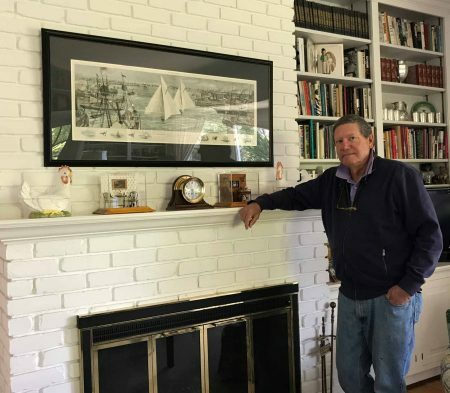 To see a slice of national and international history, see Bob Off’s roomboxes.